“Philosophers have only interpreted the world, in various ways. The point, however, is to change it,” or so Karl Marx once wrote. As trade liberalization and globalization more broadly are called into question, G20 leaders could do with both interpreting the situation and changing it. It is not an easy task for the G20, which is a diverse group of developed and emerging economies, accounting for around 80% of GDP. In spite of their great success in launching a trade and investment working group and agreeing on guiding principles of investment policy-making, G20 leaders failed to address the emergence of anti-globalization voices. Here are four things they got wrong – and three ways they can turn the situation around in 2017. Here’s the first thing they got wrong when they met in China: their statement reaffirming their “opposition to protectionism on trade and investment in all its forms”. In fact, this is not only legally inaccurate, but it’s beyond their political mandate. In the World Trade Organization’s current rule book, certain defensive trade measures are totally legitimate. That includes anti-dumping and countervailing duties, safeguard measures, and other restrictive policy instruments to protect public interest. The only caveat is these measures must be applied in a way that is consistent with the conditions and methodologies agreed by all members. Opposing all forms of protection unnecessarily raises public fears and is politically hazardous. Some protectionist measures are designed to function as indispensable safety valves, to ensure that nations have the right to restrict trade and investment in certain, clearly defined conditions, while still benefiting from progressively liberalized trade and investment. Far from being condemned, this type of protective trade measure should be guaranteed. In 2017, G20 leaders may wish to take a more legally sensible and politically nuanced approach. They could instead, for example, call on all members to refrain from using any illegal measures that seek to restrict trade and investment. They could also reiterate that any legal protective measures that are put in place should be strictly applied according to international economic laws and regulations. The second thing G20 leaders spoken about in their China meeting was the importance of communicating “the benefits of trade and open markets to the wider public more effectively”. Is this what the situation calls for right now: more preaching from trade evangelists? On the contrary, I would argue that so far, the benefits of trade have been oversold. 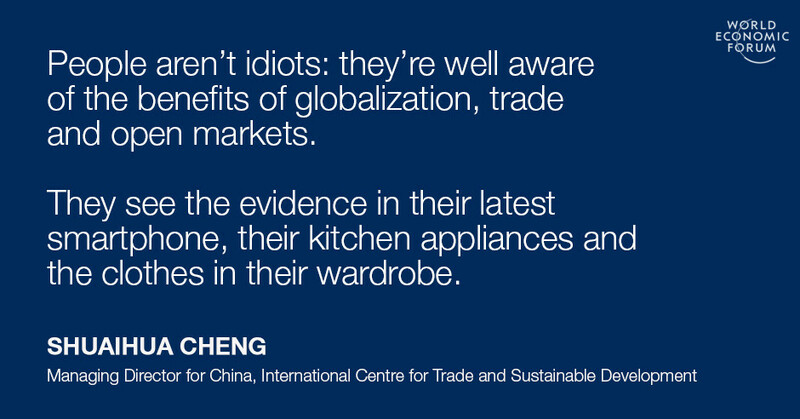 People aren’t idiots: they’re well aware of the benefits of globalization, trade and open markets. They see the evidence in their latest smartphone, their kitchen appliances and the clothes in their wardrobe. What leaders and policy-makers haven’t done is communicate the inevitable side-effects. As a result, those who lose out are taken by surprise when these negative consequences start to affect them. When they complain, they’re dismissed rather than shown the understanding and empathy they deserve. In 2017, I hope G20 leaders will speak out about these negative consequences and make it clear that those people left behind by globalization have not been abandoned by their leaders. The final thing G20 leaders spoke about in China was the need for “appropriate domestic policies to ensure that benefits are widely distributed.” In fact, it’s not just that the benefits are unevenly distributed – it’s that the negative consequences are as well. Any policies we put in place will fail unless they recognize this subtle but important distinction. At the domestic level, that calls for policies of vertical redistribution. Public authorities should use tax revenues from globalization’s winners to empower the less competitive portion of the population who fail or gain much less in more open markets, with targeted skills training and social safety nets. A similar approach could be used for creating new job opportunities: for example, authorities could use tax revenue to increase public investment in infrastructure, improving the quality of affordable education, and lowering administrative and logistic costs for micro and small businesses. Change is also needed at an international level. This has been very difficult to achieve so far, largely because there is an enormous amount of polarization between rich and poor countries. When workers in developed countries hear trade liberalization, they think offshoring and job losses to places like China, Mexico or Vietnam. When those in developing countries hear the term, they think of the multinationals that seem to benefit more from their cheap labour than they themselves do. Both complaints need to be addressed. In 2017, Germany will take over the G20 presidency. In her video outlining her vision, Chancellor Angela Merkel spoke of the need to “shape an interconnected world”, make globalization work for all, intensify international cooperation, and oppose isolationism and any return to nationalism. Interestingly, she stayed away from the ambiguous term “protectionism”. In attempting to do so, G20 leaders should consider three important points. First, while leaders must stop focusing so much on the benefits of globalization – which, as we’ve discussed, the public already know – they should still remember the strategic value of open trade regimes for international peace and prosperity. “If we could increase commercial exchanges among nations through lowered trade and tariff barriers and remove international obstacles to trade, we would go a long way towards eliminating war itself”, former US Secretary of State Cordell Hull wrote in his memoirs following two devastating world wars. The GATT, the predecessor of the World Trade Organization, was a brain child of many of those war-time statesmen. Their goal was to ensure an open, non-discriminatory and predictable trading environment. They knew all too well that when goods don’t cross borders, soldiers will. Secondly, trade liberalization alone is not sufficient for guaranteeing international peace and economic wellbeing. Other international and domestic policies should be put in place if we are to reap all the benefits of trade and tackle some of its disrupting side effects. Before developing hard policies, political leaders and opinion leaders should take a softer approach. They could start by attempting to gain a better understanding of one another’s domestic difficulties and supporting policies that could alleviate these problems and therefore help safeguard open trade. Finally, G20 leaders need to prepare for a new world where jobs are replaced by computers and automation. This has already altered the trade landscape. According to a new study , about 88% of job losses in the US manufacturing sectors were because of automation and other domestic factors, rather than international trade. If academics at the Oxford Martin School are to be believed, this trend will continue over the next two decades, with 47% of all jobs falling victim to automation. No nation will escape this future, so it is up to us all to work together. We can do that by sharing best practices on how to ensure our citizens are equipped with skills that even robots can’t do, or how to strengthen laws and legislations to protect worker bargaining power. We should also look to increase level of policy harmonization between nations on taxation and employment policies. The economic case for trade leaves no room for uncertainty, and yet trade and globalization are coming under increasing attack. Whether the sum total of benefits and downsides of trade is positive depends not just on trade. Sustainable development also requires upgrading education, infrastructure and in-country innovation, as well as mutual understandings and policy harmonization on employment, taxation and other factors unrelated to trade. To trade or not to trade, that is not a question. But if we want to make sure we reap the benefits it has to offer, in 2017 G20 leaders must not just talk a good talk; they must start acting to protect an open trading system in which nobody is left behind. The views expressed in this article are those of the author and do not necessarily represent his organization.